It is easy to imagine that the steampunk movement — science fiction featuring steam-powered inventions and a 19th-century style — is purely a modern invention, an exercise in “what if there had been a Victorian equivalent to today’s sci-fi genre?” However, early science fiction actually included much more than just the well-remembered works of literary figures like Jules Verne, and there really were a wealth of popular stories about steam-powered robots and other wild inventions before the turn of the 20th century. Many of these fictional creations were the products of boy inventor Frank Reade (or later, his son, Frank Reade, Jr.). 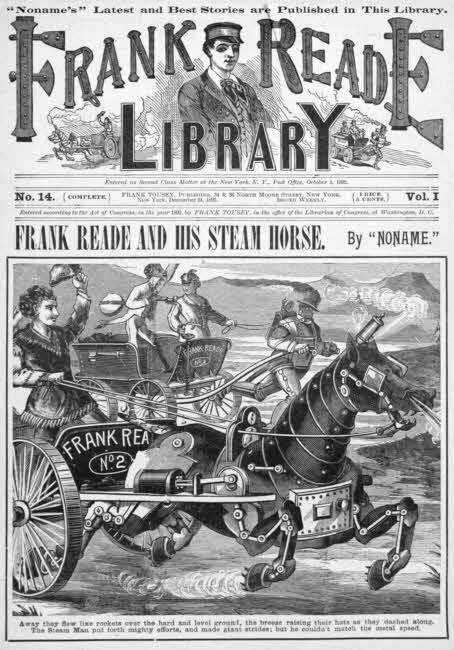 Our latest eBook release on Project Gutenberg, courtesy of Distributed Proofreaders, is an early Frank Reade adventure, Frank Reade and His Steam Horse, starring the senior inventor and written by Harry Enton before the series was taken over by the far more prolific Luis Senarens. 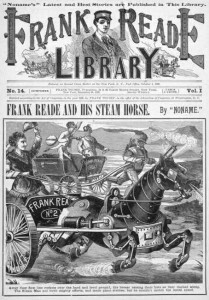 As the title suggests, this adventure involves the creation of a steam-powered horse, which 16-year-old Reade takes to the west with some of his friends and relatives to stir up trouble. This book is very much a product of its time and has some (likely unpleasant) surprises in store for the modern reader: plenty of racism and broad stereotypes, and a teenaged “hero” who sees no harm in casually slaughtering his foes en masse, as long as he’s reasonably sure they’re outlaws or Indians. It is not hard to see why Frank Reade has largely fallen off the cultural radar, but it is nonetheless interesting to study an early contributor to the science fiction genre, warts and all. The entire story can be read online or downloaded through Project Gutenberg.